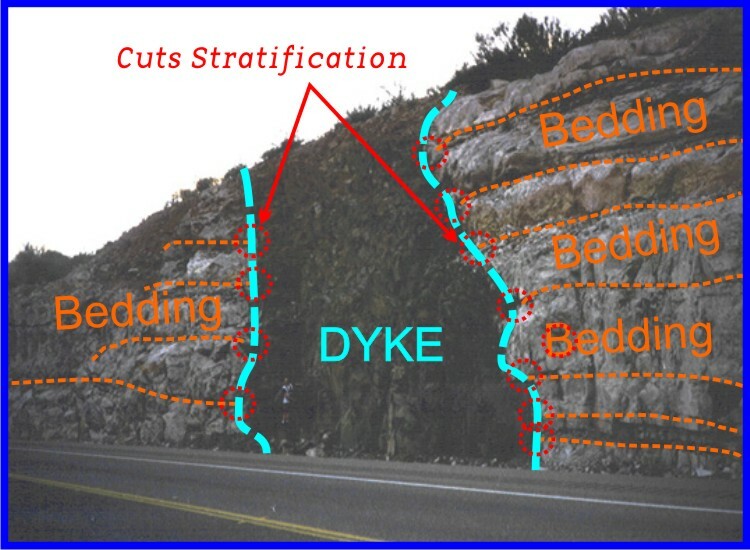 A dyke (or dike) in geology is a type of sheet intrusion referring to any geologic body that cuts discordantly across planar wall rock structures, such as bedding or foliation (see figure below). Dykes are the escape routes of hot, molten magma from over pressurised magmatic chambers and provide an insight into the chemical composition of the magma at the time of intrusion into the surrounding country rock. This EarthCache deals with intrusive dykes. An intrusive dyke is an igneous body with a very high aspect ratio, which means that its thickness is usually much smaller than the other two dimensions. Thickness can vary from sub-centimeter scale to many meters and the lateral dimensions can extend over many kilometers. A dyke is an intrusion into an opening cross-cutting fissure, shouldering aside other pre-existing layers or bodies of rock; this implies that a dyke is always younger than the rocks that contain it. Dykes are usually high angle to near vertical in orientation, but subsequent tectonic deformation may rotate the sequence of strata through which the dyke propagates so that the latter becomes horizontal. Sometimes dykes appear as swarms, consisting of several to hundreds of dykes emplaced more or less contemporaneously during a single intrusive event. The world's largest dyke swarm is the Mackenzie dyke swarm in the Northwest Territories of Canada. Dykes often form as either radial or concentric swarms around plutonic intrusives, volcanic necks or feeder vents in volcanic cones. The latter are known as ring dykes. At times, however, dykes are discrete features that tear through the country rock. Because dykes are intruded hot into the country rock they actually “cook” the country rock thereby often changing its colour and its chemistry. This zone of contact metamorphism is termed the “Chilled Margin”. Dykes can vary in texture and their composition can range from diabase or basaltic to granitic or rhyolitic, but on a global perspective the basaltic composition prevails, manifesting ascent of vast volumes of mantle-derived magmas through fractured lithosphere throughout Earth history. Pegmatite dykes are extremely coarse crystalline granitic rocks often associated with late stage granite intrusions or metamorphic segregations. Aplite dykes are fine grained or sugary textured intrusives of granitic composition. 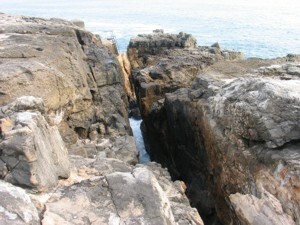 This Earthcache is located west of Lisbon in the Cascais coastline some 25 km W of central Lisbon. The country rock types are reef limestones of Lower Cretaceous (Hauterivian – Barremian; 136.4 to 125 M.a.) age striking NE and dipping gently to the SE cut occasionally by igneous dykes. What colour is the rock that makes up the dyke itself? [note: not the country rock (the rock where the dyke is intruded into)]. What is the thickness of the gorge created as a result of the negative weathering of the dyke? Is the thickness uniform or does it vary? Near your observation point do you see a chilled margin? What is the orientation of this feature? (please use the cardinal points or give an accurate azimuth). What total length is the feature (sea to GZ please)? After sending the answers by e-mail you can log the Earthcache. If there is any doubt regarding the answers you will be contacted to clarify it. Photos in the log are always welcome, but please do not post photos that show the answers of the Earthache! Holmes, A. 1981. Principles of Physical Geology (3rd Ed.). Thomas Nelson and Sons limited, 730p. Ramalho, MM; Rey, J; Zbyszewski, G; Matos Laves, CA; Mointinho de Almeida, F; Costa, C and Kullberg; MC. 191. Carta geológica de Portugal na escala 1/50000. Notícia Explicativa da folha 34-C (Cascais). Serviços Geológicos de Portugal, 87p. Moitinho de Almeida, F, 1959. Carta geológica de Portugal na escala 1/50000, Folha 34-C (Cascais). This cache has a sister: Visit Escape Route I - M5 by clicking HERE. The most exciting way to learn about the Earth and its processes is to get into the outdoors and experience it first-hand. Visiting an Earthcache is a great outdoor activity the whole family can enjoy. An Earthcache is a special place that people can visit to learn about a unique geoscience feature or aspect of our Earth. Earthcaches include a set of educational notes and the details about where to find the location (latitude and longitude). Visitors to Earthcaches can see how our planet has been shaped by geological processes, how we manage the resources and how scientists gather evidence to learn about the Earth. To find out more click HERE. 1- Qual é a cor do dique? Notem: não a cor da rocha encaixante. 2- Qual a espessura da fenda que agora figura na paisagem? 3- A sua espessura é uniforme ou variável? 5- Qual a orientação da fenda? Nota: usem os pontos cardeais ou um azimute preciso. 6- Qual o comprimento total da fenda desde o GZ até ao mar? Fotos no log serão sempre bem vindas, mas por favor não coloquem fotos que revelem as respostas da Earthcache! Depois de enviar as respostas pode fazer o log, caso exista alguma duvida em relação ás respostas dadas serão contactados para a esclarecer.